Constructions are part of the main attraction of Barcelona and it is a landmark of the city. There are so much amazing buildings that the choices were very hard and most of my selections are out of the tourist streets and not in travel books so here, my 7 wonders. on the down and top floors. If you raise your head, you will spot 3 nice crystal balcony columns which end with beautiful windows designing with an islamic style. The Torres German III House (calle aribau 180). I’m sure that everyone passing nearby will stop like me, attracted by its yellow, the main color of this modernism building. It is a work by Jaume Torres Grau who constructed it between 1906 and 1908, moreover the 2 buildings, next to it on the left and right sides, were done by the same architect few years ago. I like particularly its top which is designed in a medieval style with golden drawings on a red background contrasting nicely with the set. The 2 big crystal round columns give me the impression of 2 towers ready to defend itself against anyone trying to conquer it because they end on an outdoor terrace. The coliseum (gran via de les corts catalanes 595-599). Built in 1923 by Francesc de Paula Nebot i Torrents, he gave it a kind of monumentalist style which was very appreciated during the dictatorship of Miguel Primo de Rivera. On both sides, you will see beautiful statues done by Pere Ricart on the top of the tower and although, you can’t see it properly except if you have a camera with a powerful zoom or a magnifying glass, there is another one on the roof of the central dome. 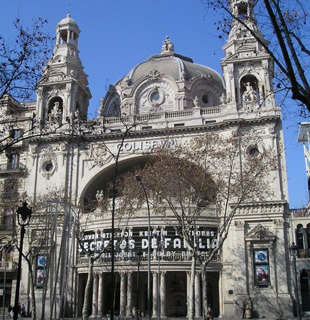 In the past, it was used as the contemporary art museum of Barcelona. 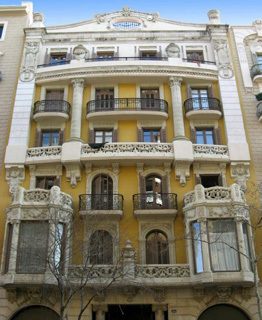 The Mila House (passeig de gracia 92). This modernist building is also known as Pedrera, it is a catalan word meaning quarry and it was built by the famous architect Antoni Gaudí i Cornet between 1906 and 1912. The most interesting part for me is its roof with beautiful decorations like the chimneys covered with ceramics and looking like the head of warriors wearing helmet. Moreover with a great view on the most beautiful street of the downtown, it is really worth to be patient and to make the huge line to discover it. It was declared in 1984 as UNESCO World Heritage Site. The Ferran Guardiola House (calle consell de cent 236). Most famous known as Xina House, it was built in 1929 by the architect Joan Guardiola Martínez who was a student of Gaudi. 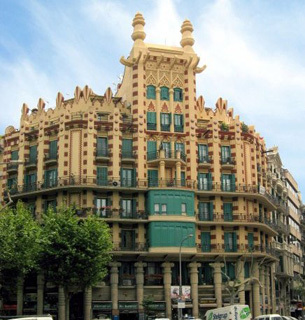 Owning a particular vision in the art deco style, he was not famous in the city and the only building he did for Barcelona it is this one with an impressive and original design introducing an oriental touch. The base is formed by many columns maintaining the whole big structure and in the central, people can distinguish a square tower ending with an interesting roof. The Vallet Xiro House (calle mallorca 304). A work by Josep María Barenys i Gambús done between 1913 and 1914, personally I’m attracted by the middle section with its 2 columns where we can distinguish a kind of separation between the down and the top floors. The down section owns 2 mini towers linked with a small terrace as if it was a passage and the top one, a big terrace with 2 nice sculptures on both sides. For your information, although the design is different, the buildings on its left and right sides are from the same architect. 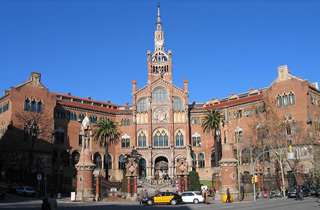 The Santa Creu i Sant Pau hospital (calle sant antoni maria claret 167). Declared in 1997 as World Heritage Site by UNESCO, it was a project directed by Lluís Domènech i Montaner. The whole complex is a masterpiece which is composed originally with a main building and 27 pavilions, each one with its own design. The buildings, near the main entrance, are the smaller ones and as one goes along you enter, they are bigger although the ones, at the same level, have the same size. One of the interesting things is that the architect designed the left side for woman so the buildings have female saint names and the right side for man so male saint names. Its discovery is a must so don’t miss the guided visit organized each day from 10h to 13h except december 25/25 and january 1/6.